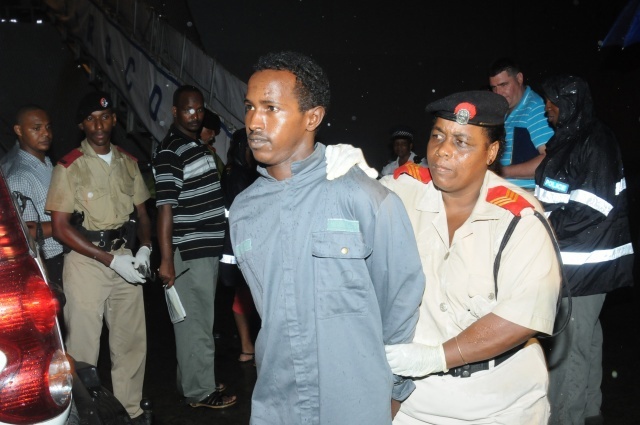 (Seychelles News Agency) - A last group of suspected Somali pirates that remained on trial in Seychelles has been found guilty of piracy offences and sentenced to 12 years in prison by the Seychelles Supreme Court on Friday. In the ruling delivered by Judge Gustave Dodin the five were convicted of two out of three counts of piracy brought against them by the prosecution. The Somalis stood accused of attacking a dhow and holding the Indian crew as hostages, as well as for using the dhow as a pirate ship to attack an oil tanker. The offences were said to have been committed in the Gulf of Aden between January 1 and January 18, 2014. Their transfer to the Indian Ocean island nation for prosecution was thanks to a pirate transfer agreement signed between EU and the Seychelles in December 2009. He noted that the case had its element of difficulty, as it was not possible to bring the Indian crew saved during the operation led by the French naval ship to testify during the trial. In March Judge Dodin had ordered that the last piracy case standing before the Seychelles Supreme Court should be heard until the end, rejecting a motion filed by the lawyer of the five accused that there was ‘no case to answer.' The lawyer was arguing that there’s no evidence that they were guilty of the piracy charges against them. Over the last six years the island nation has conducted nearly 20 piracy trials, convicted over a hundred suspected pirates, more than any other country in the region. The number of Somalis incarcerated at the Seychelles main detention facility, the Montagne Posée prison stood at 22 in March this year. This includes the last group of five sentenced on Friday. The 17 others had already been convicted and were awaiting transfer to continue serving their sentences in their homeland. According to the TV report, Judge Dodin has not made an order for the five Somalis sentenced on Friday to be transferred to their homeland to serve their 12 year sentence.